With three perfect flavor combinations, our high protein bar variety pack gives you a nutrient-rich, gluten-free, and environmentally friendly option for snacking. Let Exo Protein help you satisfy your cravings while giving you the energy boost you need! Our variety pack comes with three classic and delicious flavors that you will love to use as a post-workout snack, meal replacement, or afternoon energy boost. Capture the magic of your favorite ice cream flavor and guilty pleasure with our chocolate chip cookie dough bar. Bite into a chocolate fudge brownie bar anytime you need a shot of chocolate. Peanut butter lovers, rejoice. Peanut butter and chocolate chips come together in a chewy, scrumptious package. 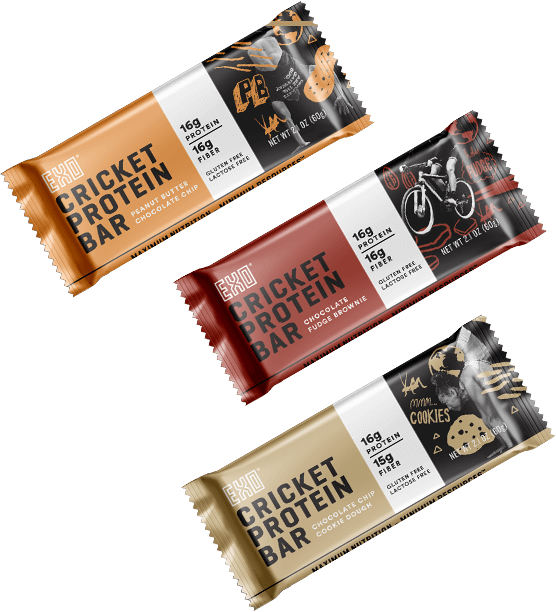 Our bars and snacks get their protein from cricket powder--a sustainable, powerhouse of protein. Raised on a USDA certified organic diet and processed with dry heat before being ground into a powder, our crickets provide an excellent source of both protein and B12. Don’t pick just one flavor when you can try them all! Enjoy our high protein bar variety pack or try our protein bites or whole roasted crickets today!